A few months ago, our friends at SnappConner PR referred us to a new potential client: Treehouse Interactive. The company had been around for 15 years—great technology, bad marketing. New money and new talent were brought in and we were asked to help rebrand. With a tight timeframe, we pulled of a mini-version of our famed d5 Perception Branding process, interviewing the new executives and researching competitors. With the selected Brand Concept Board and a new name, Impartner, we designed a new identity (see above) and a new website, repositioning them as provider of partner portals for companies that rely on indirect sales. 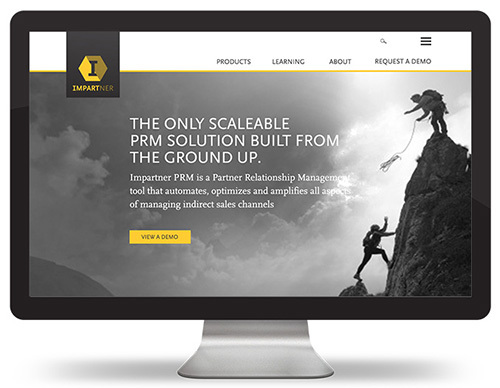 The home page lays claim to our “only, only” strategy of the first PRM solution built from the ground up. We are now working on a motion graphics video for an upcoming tradeshow.